The Harvest Moon series has struggled a little of late. The iPhone release was good enough fun, but the last 3DS outing, The Lost Valley, which was heavily inspired by Minecraft, did not go down well at all. Meanwhile, Story of Seasons, a Harvest Moon game in all but name, and developed by much of the Harvest Moon talent, was a real hit. Natsume, which still holds the Harvest Moon license, needs to get its marquee franchise back on track, and Skytree Village looks like the game to achieve that. It looks like it's building on The Lost Valley's engine, yes, but it looks like a far deeper and richer experience than what its predecessor offered. This trailer shows the game off, including the village that you get to wander around, a new animal (a donkey! ), and the familiar farming stuff that you'll get to get up to. 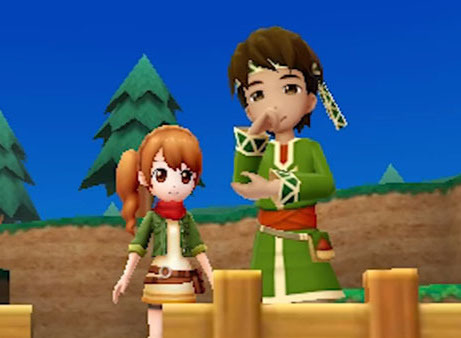 Let's face it, you know what you're getting in a Harvest Moon game, and while the whole farming simulation genre is an incredibly niche one, the fans of it play these games because they like the relaxing atmosphere, the lack of lose states, and the simple, charming music and graphics. There's something delightful about slowly building up a farm, and it does look like this game will do that appeal justice. It's up to you revive the seven Skytrees in order to give the Harvest Goddess her power back, and, in turn, bring life back to this desolate land! Along the way, players will meet a new cast of characters (with a few returning faces! ), alongside a brand new art style, new character models, and more. Play as a boy or a girl, woo bachelorettes and bachelors, and start a family! New crops and flowers to discover. New fishing mechanics: expand waterways and catch rarer fish.